Beautiful villa, private pool WIFI gorgeous gardens & mountain views- peaceful! 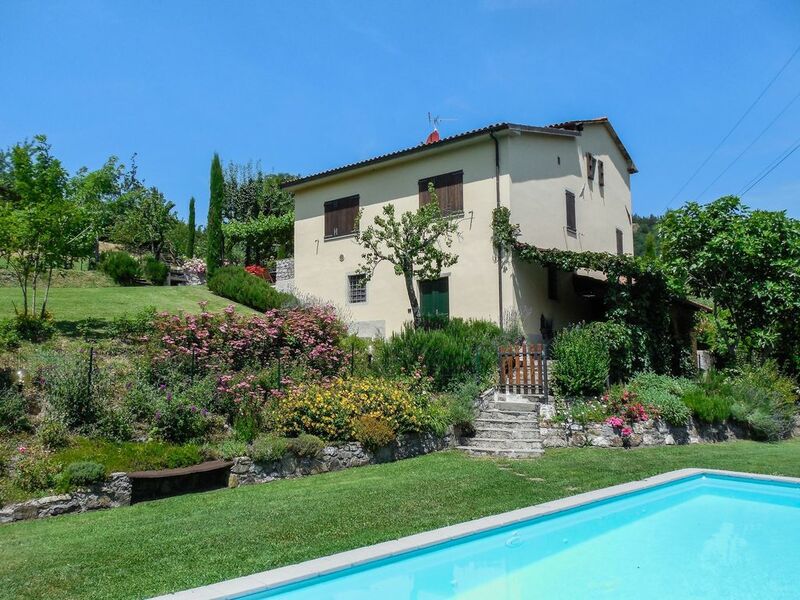 Detached house with private pools in the unspoilt, totally non commercialised, green & mountainous Garfagnana region of north Tuscany. The views from the house & pool are fantastic, and the grounds, with their own orchards a perfect place to relax. The property is beautifully, newly renovated, with sleeping accommodation/shower-rooms are split over 2 floors - an ideal choice for 2 families. There is a large well equipped farmhouse style kitchen with eating area with , dishwasher, oven, hob, fridge/freezer, and a living room with two comfy sofas, open fire and satellite TV. WIFI. In the basement there is a separate laundry area, and also a further dining room for eating at a cool temperature when it is too hot outside. Outside there are 2 terraces, BBQ private pool and large garden. The area is dominated by the hills and mountains surrounding the valley, and there are hill top villages in abundance awaiting your exploration, as well as the local Natural Parks. This is the 'real' Italy. The house is situated at the end of a private lane, a 2 minute drive from the mountain village of Poggio, which itself is located circa 10/15 minutes from local market town of Castelnuovo - less than 1 hour north of Lucca. The area is ideal for a totally relaxing holiday in the countryside with fantastic views at every turn whatever the time of year. Explore the hundreds of hill-top villages, go walking/horse riding/fishing, or fr a bike ride. Relax with a glass of wine and watch locals play Bocce, or spectate at the cheese rolling for which the area is famous! In the autumn join in the local passion of mushroom picking, or feast on chestnuts roasted on your fire! Tourism is yet to hit this area, and this is truly one of those increasingly rare places in Europe where you can experience the real way of life of the locals. That said there are plenty of options for days out and many suggestions are detailed under the ' location section' of this advert. Go on, treat yourself to a fantastic property! Cuisine: Garfagnanan cuisine is fairly simple, but scrumptious, using local fresh produce to prepare dishes, which since they are prepared in the main for the locals are very cheap! The local wine is good, and also extremely inexpensive. Plenty of places to picnic in seclusion, with provisions easily found in local bars/shops as well as the occasional supermarket. Locals: The locals are very friendly and helpful. A very well furnished & pristine house, with a clever mixture of modern & rustic furnishings. Most rooms double aspect with wonderful views. Ground floor consists of rustic Tuscan farmhouse style kitchen, with large table, gas hob, & fridge freezer. Living room with some comfy seating, log fire & satellite TV. Double & twin bedroom, large shower room. First floor, further double & twin bedrooms,, large shower room. Basement - 'laundry'. Also a further cool indoor/basement dining room for comfortable eating on those extra hot days. Since photos taken a decked sunbathing area has been built at the pool which is open from 21st March to 30th September. Larger patio/terrace for eating out, with BBQ. Surrounded by open countryside/orchard. 2 Swings for children’s use. Our villa was very rustic but charming . the views were beautiful. In the early morning mist overlooking the pool to the hills it was breathtaking. The owner was a very pleasant chap . He handed in a lovely basket of fruit and veg which we appreciated. Wish the pool had been a couple of degrees warmer but it was the start of September ( we still used it and once you were in it was ok the hard part was getting in lol ) . The near by town Castelnuovo was only a 10/15min drive down the valley and had a supermarket shops cafes etc. It also has a train station which was handy for some of our day trips. Overall we had a lovely holiday . Thank you for your review, and we are glad to hear you had a good time! The house was so well equipped like a true home from home. The kitchen in particular made cooking for the family really easy with very good knives and equipment. We really enjoyed using the pizza oven too! The area was stunning and the owner was so kind, helpful and hospitable. He helped us to plan several days out with his tips on the best places to visit. The house was very private and we really could relax and enjoy the stunning views. We would love to return to this region and would definitely recommend this property. Thank you for your review. We are glad that you appreciated this well equipped house and got some use from the pizza oven too! Good also to hear you enjoyed the region and we would love to welcome you again either here or to one of our other properties. A lovely, typical Tuscan villa with beautiful grounds, views and a fabulous swimming pool. It was very clean and well looked after and the owner was welcoming and keen to tell us about the local area. Would definitely recommend! Thank you for your review. We are glad to hear you enjoyed this well loved villa and pool and that you would recommend! Very happy that you found the villa to be wonderful and that you loved the scenery too! We stayed here in May 2018 as a group of 4 including 2 kids. Everyone enjoyed it lots. This is the 'real' Italy, and due to fact this area is not touristy it is very cheap for eating out, and trying local cuisine. Pisa Airport is 90 min. ; Florence 2 hr. ; Genoa 2.5hr. All this peace and yet only a short drive from villages, and one can even walk down to the river. There is a train station in the village, for easy exploring and in Camporgiano 4.5km away you will find basic shops/supermarket/bars/restaurants and a privately owned castle. The property is located a 10 minute drive from the market town of Castelnuovo and 25 mins from the mediaeval town of Barga both with their various bars and restaurants. Pisa 90 mins; Lucca 1 hr Florence 1 hour 50 mins; mediaeval villages everywhere; National Parks 20 mins. Closer to home there are plenty of little historic villages to visit, many of which have local festas in the summer. There are also the lakes of Gramalazzo, Vagli (with its hidden village submerged by the water) and Pontecosi, and some guests love to swim in the river. The house is also ideally located for visiting the local Fortress at Verrucole which is a good afternoon out, with stunning views and some interactive activities for the children. Also close by is the Buffardello tree climbing and zip wire park (ideal for both adults and children of all ages with a variety of runs) where one can take a picnic and spend the entire day in the welcome shade of the forest. There are plenty of dining options and your kitchen is well equipped for evenings dining al fresco at home.